1. Heat 1 tablespoon of the oil in a frying pan or wok over a high heat until hot. Add the tofu and garlic and stir-fry for 2 minutes until the tofu absorbs the flavour of the garlic. Using a slotted spoon, remove the tofu and drain on kitchen paper. 2. Heat the remaining oil in the pan, add the green beans and fry over a medium heat for 4 minutes, or until the beans are lightly cooked. Add the herbs, spring onions/scallions and tamari and stir-fry for a further 1 minute. 3. 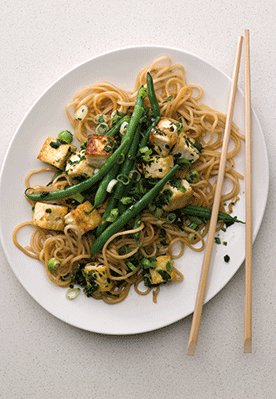 Return the tofu to the pan and stir-fry for 1 minute until the flavours have merged. Season with pepper and serve immediately with rice or noodles.